Garnets are generally unearthed in the numerous lenticular rodingites scattered everywhere around this area. The samples are very varied in size and their crystal habit is typically rhombododecahedral, but compound forms presenting countless facets are also common. The colour ranges from brown and cinnamon tones to dark red, as the composition varies in content of grossularite, andradite, and almandine. Along the crevices in the serpentinite, small crystals can be observed; they are dark brown in colour and very shiny, and therefore visible even from quite afar. The garnets are frequently associated with vesuvianite, a mineral in the form of individual long prismatics or as crystalline groups often positioned above the garnets. Many specimens, contained in veins of rodingites which cut through the serpentinite rock, are associated with other minerals such epidote, titanite, and diopside. The garnets are common components of the rodingites which form due to interaction of fluids with oceanic rocks subsequently subjected to the transformations of Alpine orogenesis. 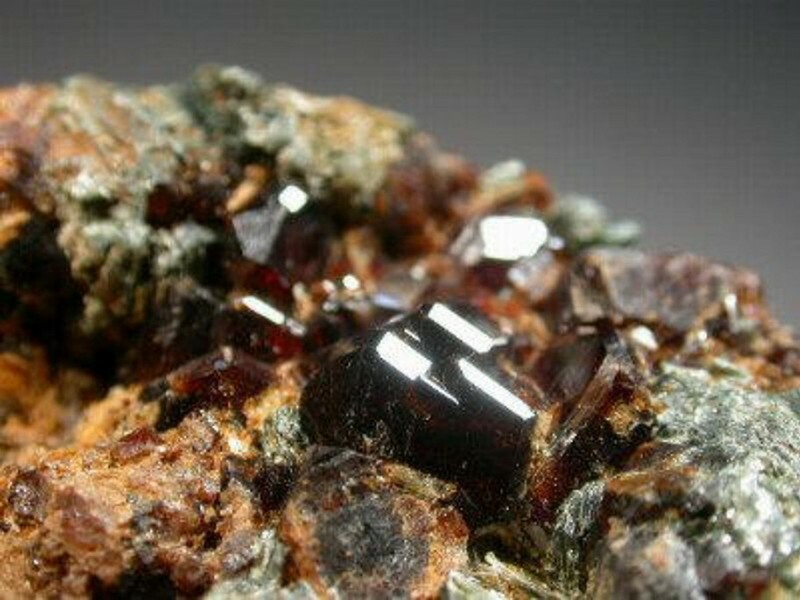 In addition to the Passo del Faiallo, the garnet crystals are also found south-west of Piampaludo, at the Torrente Orbarina (a tributary of the Orba) and Valle della Gava. Please note that it is strictly forbidden to gather minerals and rocks within the Geopark.